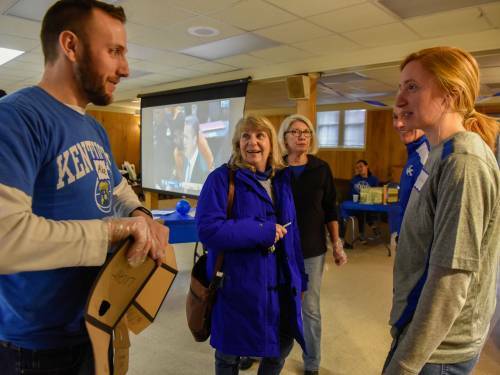 LEXINGTON, Ky. — The Kentucky Wildcats men’s basketball team lost its showdown at the University of Tennessee Saturday, but that didn’t dampen the warmth of the spirits of those watching the game on a big projector screen at Maxwell Street Presbyterian Church next to the UK campus. 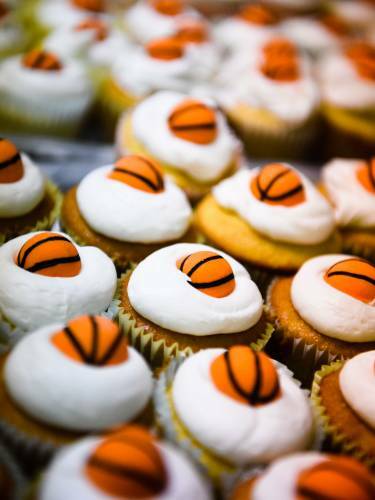 People experiencing homelessness and financial instability were welcomed by University of Kentucky students and church volunteers who served them a meal — and plenty of snacks and desserts during the broadcast of the game that followed. Out of respect for their privacy, Presbyterian News Service is identifying the people served Saturday by their first names only. 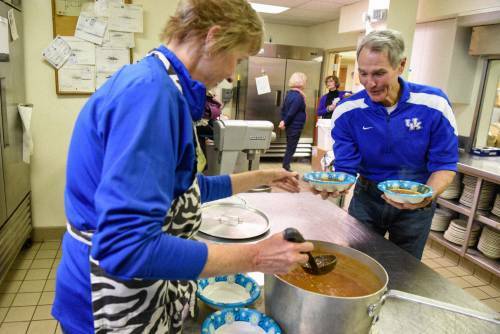 Souper Saturday is the brainchild of Ralph and Cindy Bollinger, who moved to Lexington in October 2008. Newly retired at 60 and looking for volunteer opportunities, they visited Maxwell Street Presbyterian Church, where the pastor at the time, the Rev. Woody Berry, mentioned that the church put on a dinner Thursday evenings for people experiencing homelessness. “We came that night and got hooked,” says Ralph. He and Cindy — who spent her career working as a dietitian — have rarely missed a dinner since that first one they attended 10 years ago. As the Bollingers got to know the other volunteers, they started talking about doing something beyond the Thursday dinner that would bring “a little extra joy,” as they put it, into the lives of those who were coming. 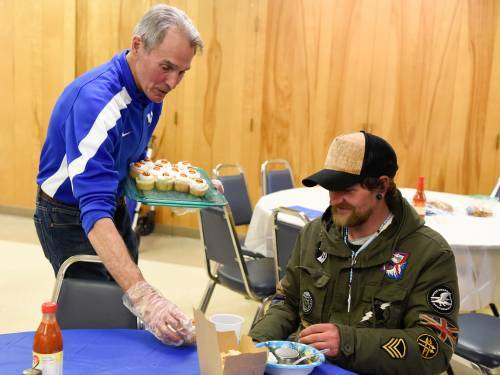 Listening to the people they and others served week after week, they got to know the diners — and recognized that many were big fans of UK’s storied basketball program. So is Keith, another who was fed and enjoyed the telecast Saturday. He said he has fond boyhood memories of listening to radio broadcasts of University of Kentucky games. “It was the only thing that stopped my dad from working on the family farm,” he said. Anywhere from 30 to 130 people attend Maxwell Street’s Thursday night meals. The Souper Saturday event often attracts 100 people. Some years, a handful of UK cheerleaders performs for diners. “Today is about them feeling at home and like they have a place where they belong,” he said. That message resonates with Souper Saturday coordinators Kay Roberts and Susan Gill. When recruiting volunteers for the event, Roberts emphasizes the importance of sitting at the same table as their guests. The more that Ralph Bollinger listened to the people coming on Thursday night, the more he thought about the things he couldn’t do for them — like cure their illness, give them great jobs or kill some of the demons they might have.